Will they survive the difficult conditions at Clay and Limestone? Is this plant a nectar or pollen source for pollinators? Is it a host plant for pollinators? Is this plant available locally, therefore, more likely to survive the extremes of the Central Basin? Will this plant add to the diversity of my pollinator friendly garden? Is there a native plant that makes more sense then that seductive exotic? That's not to imply that all the plants in my garden meet the above criteria. Some small trees, shrubs and perennials are planted just because I like them. For instance, Bat faced cuphea was planted in containers near the front door. No way, would an iffy, albeit beautiful exotic, take up valuable garden space that's reserved for natives. I was doubly delighted to discover that it was visited the Bumbles, smaller bees and a few hummers. Now, that it's officially spring at Clay and Limestone and the local nurseries are beginning to stock that seductive plant material, it's time to assess 'real' garden needs! In a garden like mine, with shallow, nearly neutral clay soil over limestone bedrock, plant real estate is valuable! Tommies drew the eye and honeybees! Primarily from my garden region. Annuals when they are available ~sweet alyssum, cleome, Calliopsis, Coreopsis tinctoria, salvias (Scarlet sage, Blue anise sage, Autumn sage and Pineapple sage), lantana, sunflowers and zinnias ( I scatter seeds, but, sometimes planting them is better! 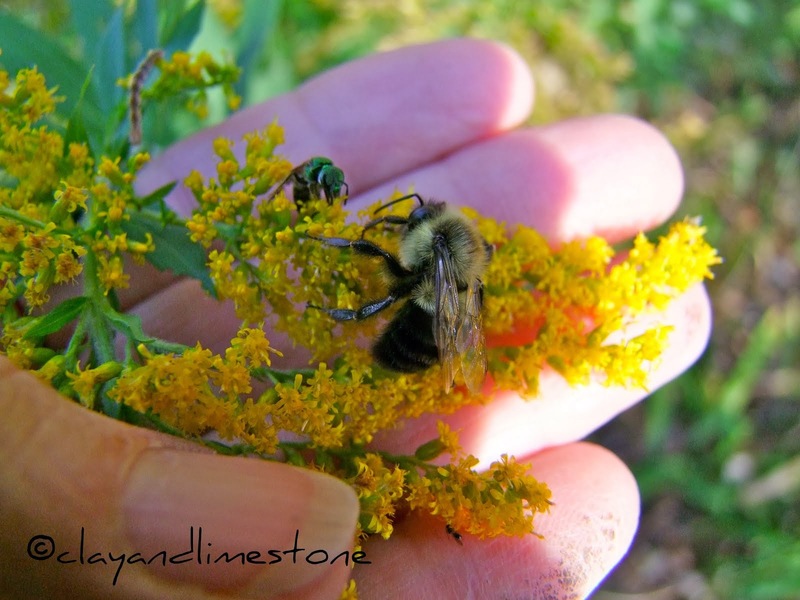 Tell me please~What's in your garden or on your shopping list for pollinators? PS Of course, you already know what I am going to say. If you want to attract pollinators~Never, never, never, ever, use pesticides in your garden. 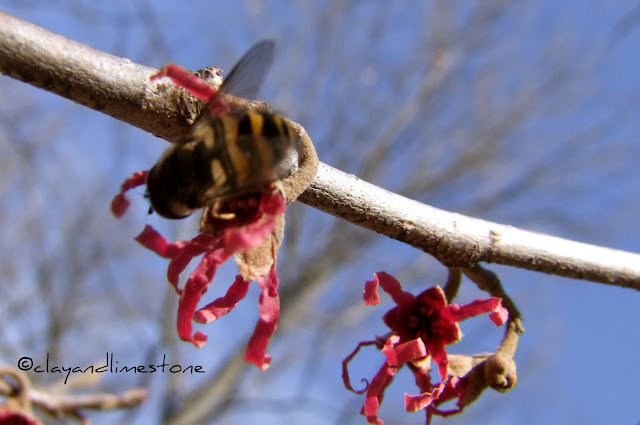 This post is part of a series on native pollinators in the garden~ Earlier posts and their links are listed below for your convenience. On my list (in my fridge stratifying in damp sand) is Yellow Pimpernel and Honewort for Swallowtails, and Early Meadow Rue and Violet Wood Sorrel for bees. Heather, That's a great list! Fantastic criteria for your shopping list. While many of my purchases this year were vegetable plants I did make room for borage strictly because I heard it was a great pollinator plant. Hi! Happy to see bees in your post. I have also posted on bees today. Funny, your bees look like they are wearing fur coats. Must be the cold weather. 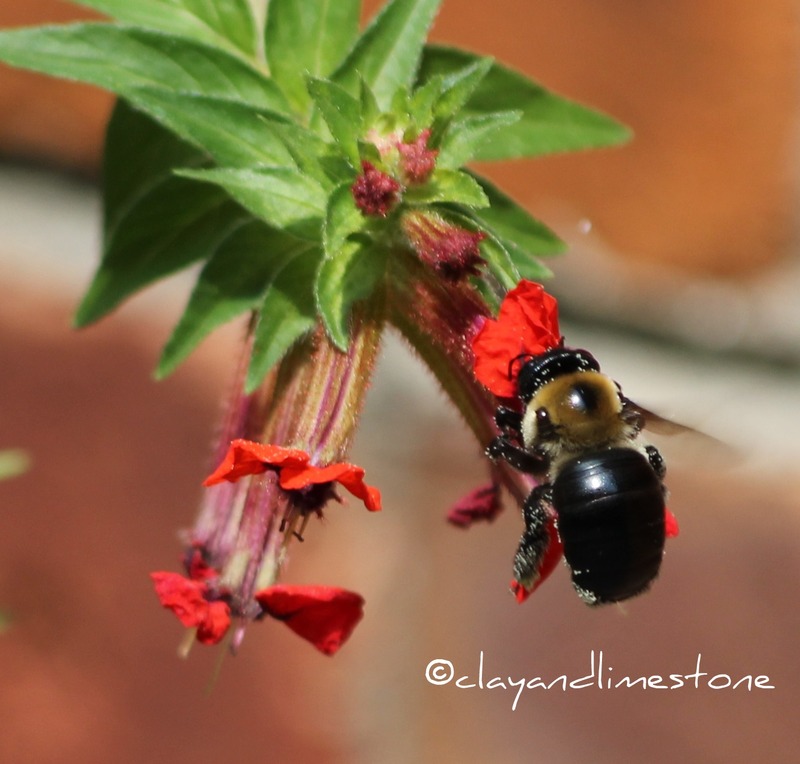 I see lots of pollinators visiting my garden, but have never systematically made a list of the plants they like. I have given more thought to attracting birds than to attracting pollinators. Thank you for the gentle nudge. Oh yeah, some shade tolerant sedges in a damp area. Definitely. I just want to bolster my milkweeds this year. Who knows what's going to ome back in a month. I have the spicebush (lindera) but it is in a dry spot and I think I'm going to move it this week to my mother's property. Maybe it will be happier there. You remind me, I have milkweed seeds. They started life as part of a flower art demonstration, but I wanted the seeds ... now I just have to find out when, and where to plant them. We're heavily focusing on pollinators this year, and actually vetoed some hybrid blooms because they were pollen sterile! I ask you, what use is a pollen sterile flower to a bee!? Anyhoo, we're currently thinning out part of our garden, removing unfavorables, and leaving the natives. In between the existing natives, our shopping list primarily consists of an assortment of native Salvias, and a variety of native Ceanothus. After seeing the bees mugging the little bit of Ceanothus we have last year, it was clear that we need to plant more...much MUCH more! ;) In addition to that, we've been planting swaths of rosemary, as it's one of the few plants that bloom here in winter, and it's a fantastic nectar source for bees. Look at all the bees you have already! It's much too chilly here for any kind of insects yet, but I hope I'll be ready for them when they come. I was happy to see that I have many of the plants you've listed here. And I do have lots of clover in the lawn, which may not win me any "beautiful lawn" awards, but the bees sure love it. If I buy any plants for pollinators it should be more winter bloomers. Maybe a witch hazel. Great photos! Exciting list Gail - I have asclepias standing by ready to be sown as soon as I have room, Dahlia 'Bishop's Chrildre', apparently nectar heaven, growing away strongly, sunflowers, verbenas, cleome, zinnias either sown or ready to sow as soon as I have space. I've also got more Knautia macedonica, it was mobbed all last year by bees and hoverflies, and self seeded well so I will spread more of it around, both here and at the allotment. You are the inspiration for a lot of this! The native bees are out now, which makes sense since the Redbud is about to bloom, and the bees go crazy over it! I want to add more Redbuds, get Blue Toadflax going again, and make sure there's plenty of Gerardia around. How is the fragrance of your Lindera? Sweetbay, On warm, sunny days it's lovely. But, it's been raining and cold for the last many. It would be very happy on your moist garden site. Brooke, Thank you! I am gratified to hear that others are inspired. Last year only natives were added here, and it will be the same this year (other than containers and the veggie garden.) I'm not buying plants, just seeds, so we'll see what comes up! Loved this post Gail, and all of them you've written in your pollinator series. We need our pollinators, and they need all the help we can give them. You're making a difference - keep spreading the word! Wonderful "requirements" for your garden! I'm adding more Joe Pye and Ironweed for the pollinators, especially the butterflies. I've sown seeds of several milkweed varieties. The butterflies love the bottlebrush agastache, such as my 'Blue Fortune', so I will increase that one. The hummingbirds love my salvias, and I'm planning to divide and conquer more space with those. Also, I'm adding more of the large perennial lantana 'Miss Huff' to the butterfly garden to fill up space (less maintenance) and give the pollinators another favorite. 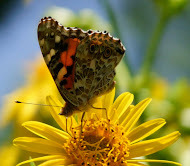 Last, but not least, I will sow plenty of zinnia seeds for the butterflies do love the blooms so much. You asked about A. ciliata ~ I was planning to try it at the top of my hill, which is basically sand, but in other places too, in case it just needs good drainage and not necessarily sand. And I found this ~ check it out!